My felt creations this time are inspired by the creepy crawlies of Halloween! It’s a little ghost family. A mommy ghost, a daddy ghost, and a baby ghost. You can decide who is who. It’s like the three little bears but scarier because it’s ghosts!!! I decided to hang mine up with some thread, so that they appear to be floating in thin air. Just like real ghosts! I think that the faces turned out pretty adorable. These are my tiniest creations as of yet. They are only about 1.5 to 2 inches tall. They are little yet pack that scary punch. They are great Halloween decorations. 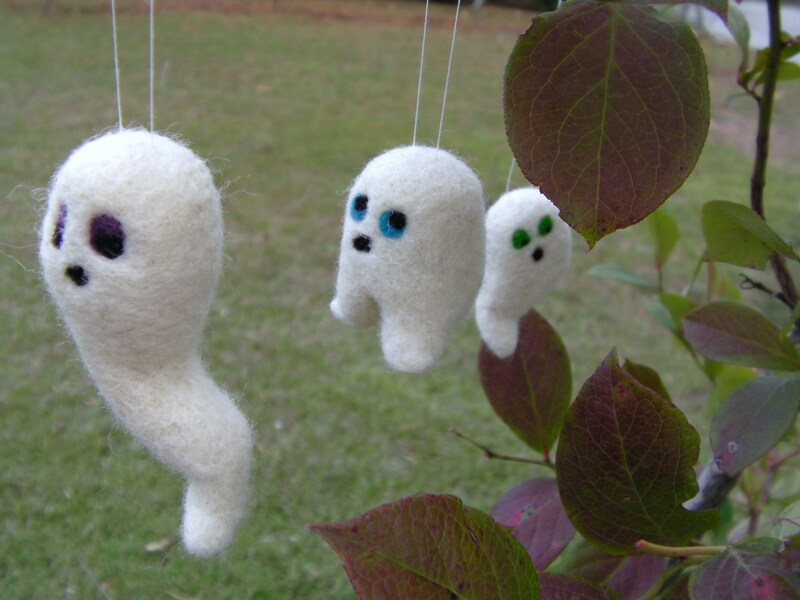 Hang them near the candy bowl, on your kids’ bunkbeds, or under doorways. They are also great little handheld toys for this time of the year. Kids are sure to moan “woooo” when they are holding these little cuties. 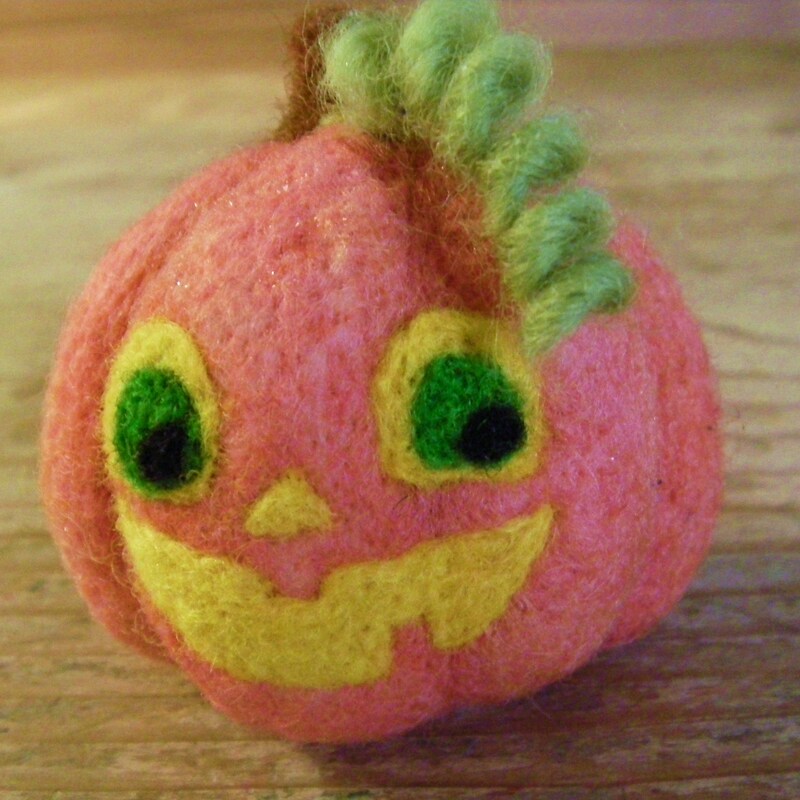 Felted Fall Pumpkin turned Jack-O-Lantern! 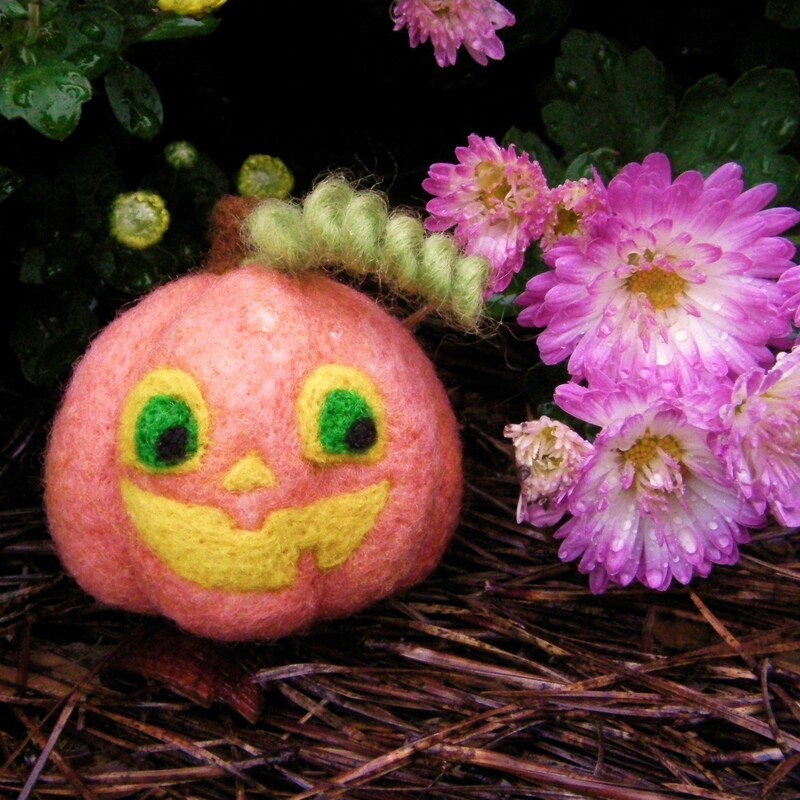 Last post, I showed everyone my little fall felt pumpkin. Today, I will show you that same pumpkin with a “scary face”! Get ready! Hide the children! This is one monstrous jack-o-lantern! Alright, alright, he is actually not very scary at all. 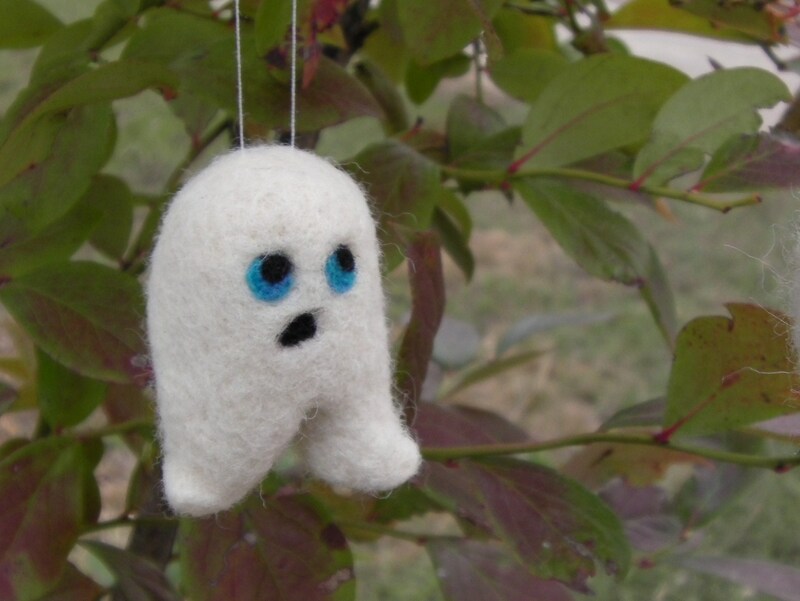 Doing this felted project brought back some cherished childhood memories. Sitting at the table, assigned the task of drawing a scary jack-o-lantern face knowing that the scariest will win. I was one of four kids and my chances were pretty low that my spooky drawing would win; throw in my dad’s drawings and I was sure to lose! My dad could create the scariest jack-o-lantern faces. And while he might would “use” my eyes, or nose as inspiration on the finished jack-o-lantern; everyone knew that it was my dad’s drawing on that pumpkin! Perhaps I should have consulted him before felting my version of a “scary” jack-o-lantern, because after all these years I still can’t compare. I made his eyes, nose, and mouth yellow to resemble that inner glow that all jack-o-lanterns seem to contain! And he actually looks rather friendly, like a young child who has lost a few teeth! Not intimidating at all. But I love cutesy, so he will do just fine for me! 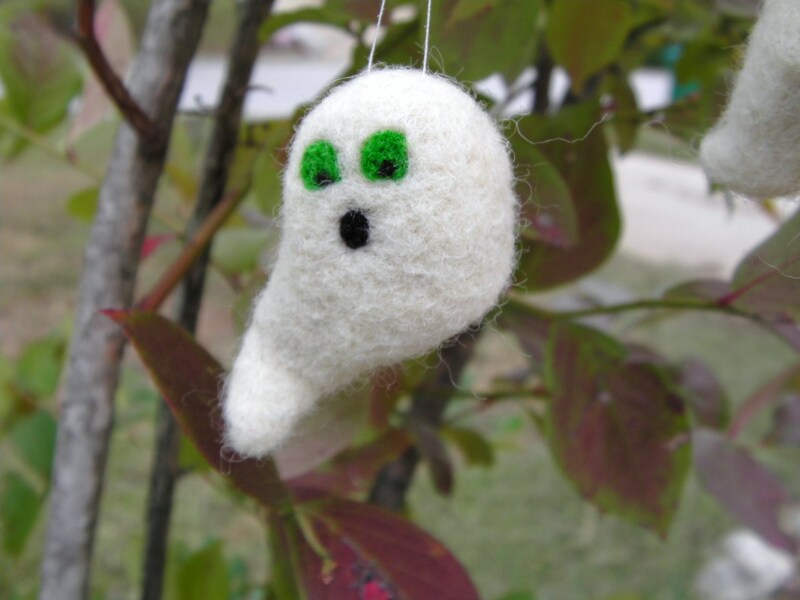 I hope you all were inspired to create “spooky” or “cutesy” Halloween decorations of your very own. My Little Fall Felt Pumpkin! Fall is upon us, as is harvest time, Halloween, dare I say Thanksgiving. Pumpkins just shout autumn. I will see pumpkin after pumpkin over the next few months, and I’m throwing my hat into the ring. 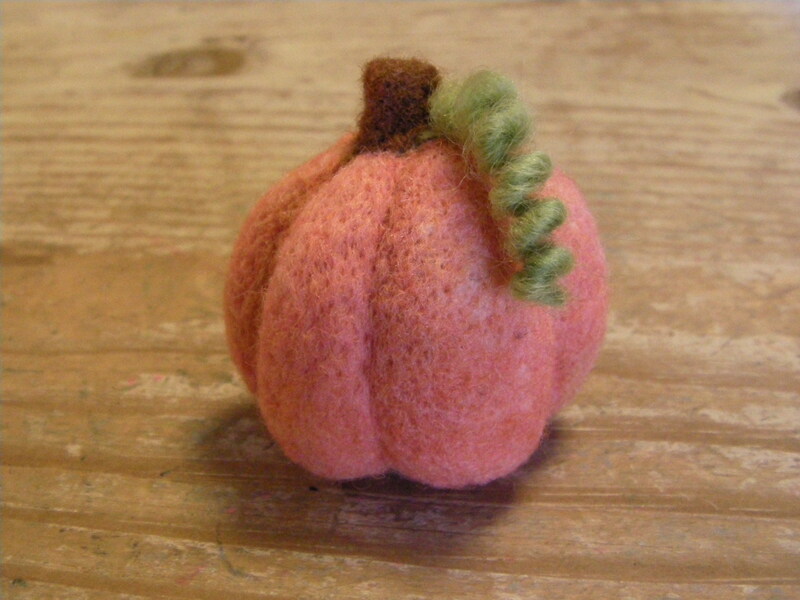 Here is my little fall felt pumpkin; curlyque vine and all. 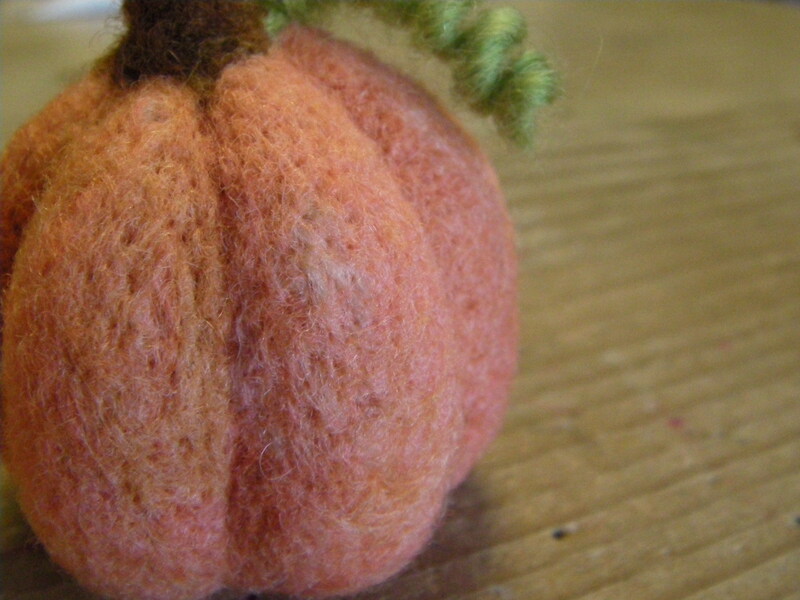 This little pumpkin fits in the palm of my hand and would be a perfect addition to any fall decor. Throw one in with a pretty bowl of colorful apples; set him amongst different size gourds; or add it to a Thanksgiving centerpiece. The breezy autumn sky is the limit. Perhaps, I will add a cute, yet scary, Jacko-lantern face on the little pumpkin. You will have to wait and see!